Hotel Neelkant is located in the centre of the Haridwar town, at the banks of the Ganga, easily accessible from the railway station and the bus stand. 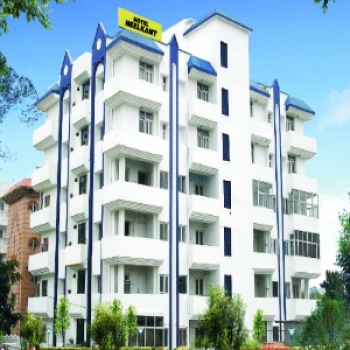 It is a budget hotel that provides all modern comforts at a nominal rate. Hotel Neelkant is located on NH 58, near Kankhal. It is just 2 kms from City Center, 2 Kms from Railway station and Bus stand of Haridwar. The hotel is 3.5 kms from the Har Ki Pauri. The Neelkanth hotel houses 24 well furnished rooms & 4 suites. Each room overlooks the Ganga with open balconies. 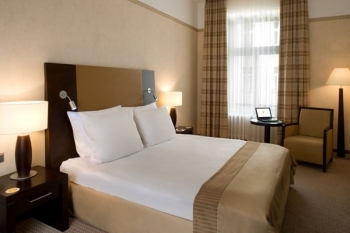 All rooms are air conditioned (except Standard Rooms) and are appointed with wall to wall carpeting, colour TV with satellite connection, en suite baths with running hot and cold water and round the clock room service. Standard Room: Standard room is lowest price room available at Hotel Neelkant, which is aircooled & equipped with all the modern amenities. Deluxe Room AC: Cream-coloured, this room is designed with a balcony, overlooking the Ganga. A large bed, a wooden cupboard, a dining table with two chairs and a sofa set with a coffee table make up the furniture in this room. It is also provided with a telephone and a satelliteTV for the entertainment of the guest. Deluxe Suite: Deluxe suite Room is the largest selling room among the business traveler who come to haridwar for business purpose. It is favourite because of it's luxury, comfort and a lots of space in the room to do business work. Maharaja Suite: Elegantly decorated, this spacious room is designed with an extra living space maintained with a sofa set. A large bed, a wooden cupboard and a dining table with four chairs make up the furniture in this room. It is also provided with a telephone and a TV for the entertainment of the guest. The Nellkant hotel have multi cuisine restaurant - Gangotri which churns out vegetarian delicacies from all over India - Gujarati, South Indian and so on - and also Continental fare. The hotel has a conference room and also boasts of power back up, power back-up, laundry service, car park, a room for your driver, complimentary transportation. Other facilities include a meeting room, multi lingual staff, PCs and fax. Please Note: The hotel has limited parking space and most vehicles are parked along the roadside due to the lack of parking space.